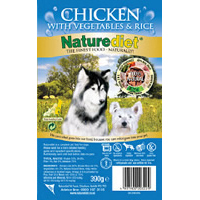 Naturediet Dog Food is a complete and balanced holistic food supplied in a moist foil, that contains wholesome natural ingredients that are healthy and palatable with NO artificial additives, preservatives or colourings that is hypoallergenic and suitable for all breeds, especially those dogs that suffer from dietary intolerances and allergies, that can cause digestive disorders and skin complaints. Naturediet's holistic approach to dog food is based on addressing the whole' rather than just the symptom, for example a dog with a skin irritation may not entirely benefit by treating the skin, the problem may actually be due to sensitivity to one or more of the many chemical additives, or unnatural ingredients used in many dog food brands. Naturediet wet dog food contains seaweed extract, natural vitamins and minerals, Omega 3 fatty acids, anti-oxidants from Vitamins E & C, brown rice to avoid gluten associated allergies such as diarrhoea and weight loss, to keep your dog naturally healthy! Naturediet dog food is cooked at high speed using only steam to ensure minimal damage to the quality ingredients, keeping them as close to their natural state as possible, making the food ideal for fussy eaters! The Naturediet Recipes contain on average 60% meat that is all sourced from approved suppliers and is processed to human consumption standards. Depending on the variety chosen the protein of adult naturediet flavours varies from 9 - 10%, whist the puppy junior recipe contains 12% and the senior light which has been formulated for overweight or less active dogs has a protein level of 8%. Each naturediet dog food recipe is formulated using easy to digest high biological ingredients, for instance high quality meat, rice and vegetables, so unlike many wet or foil pet foods the amount of naturediet your dog has to consume to receive the correct level of protein for their size, breed and activity level is less than most competing tinned dog foods! Naturediet is one of the few wet dog foods recommended by nutritionists to help dogs prone to colitis and other intestinal disorders, due to it's natural ingredients and formulation that does not include any chemical additives, stabilisers or cheap fillers reducing the risk of food related allergies or intolerances. - All naturediet recipes contains No chemical preservatives, fat emulsifiers, additives, colourings or cheap fillers! NatureDiet: 5 stars out of 5 based on 1 user reviews. Great shopping experience - they had exactly the products I needed and it was delivered very quickly. Nice and easy - exactly how it should be!